LONDON, England (CNN) -- "I want to scare you about climate change," says Fred Pearce, veteran environmental journalist and author. "We are probably the last generation to be able to rely on a stable climate." Addressing a sympathetic audience at the Cheltenham Science Festival, Pearce is preaching to the converted about the reality and risks of climate change. But it his fear -- as the title of his new book, "The Last Generation: How Nature Will Take Her Revenge for Climate Change" (it is called "With Speed and Violence" in the U.S.), suggests -- that we still haven't fully realised the apocalyptic forces we have awoken and the reality of what is at stake if global warming continues untrammelled. This is not just about warmer weather, environmental degradation and a looming refugee crisis, according to Pearce, but "about our survival as a species, as homosapiens." This year's series of reports by the Intergovernmental Panel on Climate Change (IPCC) have been broadly welcomed for a sober and sensible tone, which, while acknowledging the dangers of global warming, also suggested that our destiny was still in our own hands. Our carbon emissions would have to be slashed with strict targets set and met by 2050 to avert catastrophe but this was essentially a man-made problem with man-made solutions. But Pearce says the IPCC reports are "not the whole story." Carefully restricted within narrow parameters framed by measurable quantifiable change and imprecise computer modelling, what they don't factor in are the "long shots" which could throw all our existing certainties into disarray. "The truth is, the more we observe about the climate system, the more frightening the scenarios that scientists are starting to develop," Pearce says. "Past climate change has been more violent and extreme than we have been led to believe." In the history of the planet, Pearce argues, the past 10,000 years since the end of the last ice age, in which humanity has established itself as the earth's dominant species, have been unusually benign in climatological terms. But that tranquility "looks like the exception rather than the rule." Now he warns, human activity in the space of less than 200 years threatens to re-awaken extreme climate change of the sort never experienced in the era of recorded history. Already, average sea level rise has doubled in a decade due to the destabilisation of the Arctic and Greenland ice shelves. "We could soon be measuring sea level rises in meters, not centimeters," says Pearce. "Old ideas about climate change are just not how the world works. When climate does change it does so suddenly and violently." He highlights one such episode 11,000 years ago when temperatures in some parts of the Arctic warmed by 16 degrees Celsius (9 degrees Fahrenheit) in the space of a decade: "Nature flicked the switch 10,000 years ago. We could be flipping the switch again." As Pearce says, the "last generation" of his book title refers to the final years in which we will be able to depend on a stable and predictable climate. The challenge for future generations, he predicts, will come in dealing with the sudden destabilisation of the planetary ecosystem and the social chaos likely to ensure. "When that certainty fails, how will society respond? One hurricane (Katrina) brought the world's greatest nation to its knees. We believe we can control climate change but I wonder whether that is actually the case." That, however, does not alleviate the need for urgent action, says Pearce, insisting he retains a sense of "apocalyptic optimism" harbored by the sense that politicians, in the IPCC reports, U.S. acknowledgment of the scale of the problem and the beginnings of moves towards a post-Kyoto consensus, are finally treating climate change seriously. "The technology to do things so much better is there. The economics is not hard, they're not going to break the bank. The problem is political, making it happen. I hope we are reaching a political tipping point." He also sees hope in the fact that corporations have spotted lucrative potential in adapting to ever more-stringent environmental regulations more effectively than their rivals. The next step, Pearce believes, is to add an ethical dimension to the struggle by highlighting the fact that those intitially affected will be almost entirely located in the developing world where infrastructure and resources are already at their most over-stretched. "If the economics is what gets the politicians going, it's the ethics that gets the people going," he says. 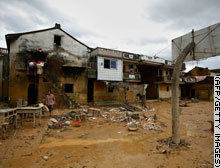 Flooding in China this month killed dozens and affected around 13.5 million people. Are we too late to avert catastrophic climate change?